Races and results, FAQs, training and contact details. The Garden State Canoe Club promotes canoe and kayaking and outdoor sports. White water to flatwater paddling, canoe trips, training, rescue, and social events. Involved in Marathon Canoe Racing in the Nebraska and Kansas area. Provides information about the association, events, race schedule, results, history, photos, forum, and related links. Guide to the Boundary Waters canoe area of northeastern Minnesota with information for planning a canoe trip, winter camping, or finding a cabin for a family vacation. Located in the heart of canoe country at the northernmost end of the Gunflint Trail. Canoeing access to Quetico Provincial Park and the Boundary Waters Canoe Area (BWCA). Canoe and kayak rentals and sales as well as self-guided and interpretive-guided paddling adventures on the Hillsborough River. Various trips with maps and prices, special events, wildlife observation list with photographs, brochure request, and links. Outrigger canoe racing team in Redondo Beach, Southern California. Includes membership information, events, calendar, practice schedule, and club history. Canoe and kayak trips on Michigans AuSable River. Offers day trips for a canoe camping family adventure. Hawaiian outrigger club. Includes club information, map, events, photos of building a canoe, race information, and related links. Canoe outfitter and resort in the Boundary Waters area. Includes information about canoe camping and fishing trips, accommodation, photos, and area wildlife. Located in Grand Marais. Provides canoe and sea kayak instruction, boat rental, and guided trips. Also offers canoe and kayak certification courses as well as hiking and snowshoeing excursions. Based in Toronto, Ontario, Canada. Boundary Waters / BWCA Outfitters for canoe trips in Ely, Minnesota. Specializing in canoe camping trips, fishing, fly-in, and Scouts High Adventure. Offers BWCA and Quetico canoe trips from Ely, Minnesota into the Boundary Waters Canoe Area. Cabins and campground on Moose Lake, adjacent to the BWCA wilderness. Providing boundary waters canoe and fishing trips into BWCA and Quetico Park, Boundary Water Canoe Area Wilderness outfitting and resort log cabins, Ely, Minnesota. Providing boundary waters canoe and fishing trips into BWCA and Quetico Park, Boundary Water Canoe Area Wilderness outfitting and resort log cabins. How to build an ultra light stitch and glue plywood canoe that really looks like a canoe. Canoe Illinois beautiful Vermilion river in north central Illinois. Offering canoe rental and livery services for the Vermilion and Illinois rivers and the I M Canal Waterway. Just 15 minutes from Starved Rock state park, 1.5 hours from Chicago. Club goal is to perpetuate the sport of outrigger canoe racing through the Hawaiian spirit of `ohana or family. Based in the southeastern part of the Washington state. Includes news, photos, event schedule, practice times, race results, member information, canoe terminology, and related links. Provides details on canoe and kayaking activities around Malaysia and Singapore. Canoe and kayak shop with sales, rentals and repair facility. Canoe, inner tube, raft, and campsite rental. Rates available on website. Canoe trips through Desoto National Forest in southeast Mississippi. Canoe camping and fishing information for the Boundary Waters Canoe Area Wilderness and Quetico. Log, photographs, links, gear, stories, and contacts. Canoe and kayak shop with sales, rentals and repair facility. Saint Petersburg. Offers canoe trips on the Rock River in Oregon. General information, photographs, and contacts. Sprint, whitewater, marathon and voyageur programs. Hall and canoe rental information. Providing canoe rental and shuttle services on the Guadalupe River. Located in Canyon Lake. Canoe on the South Branch of the AuSable River. Offers canoes, kayaks, and tube rentals. Kayaking, and canoe guides, offering rentals, lessons, and guided trips. Offers personalized canoe trips including fishing and cabin rental. Based in Quetico. Offers canoe and kayak trips on the scenic Upper Cuyahoga River. Located in Hiram. If the business hours of Scottish Canoe Association - Wild Water Racing in may vary on holidays like Valentine’s Day, Washington’s Birthday, St. Patrick’s Day, Easter, Easter eve and Mother’s day. We display standard opening hours and price ranges in our profile site. 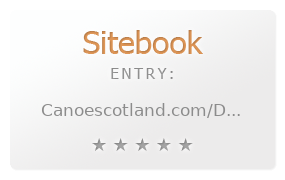 We recommend to check out canoescotland.com/Default.aspx?tabid=67 for further information. You can also search for Alternatives for canoescotland.com/Default.aspx?tabid=67 on our Review Site Sitebook.org All trademarks are the property of their respective owners. If we should delete this entry, please send us a short E-Mail.